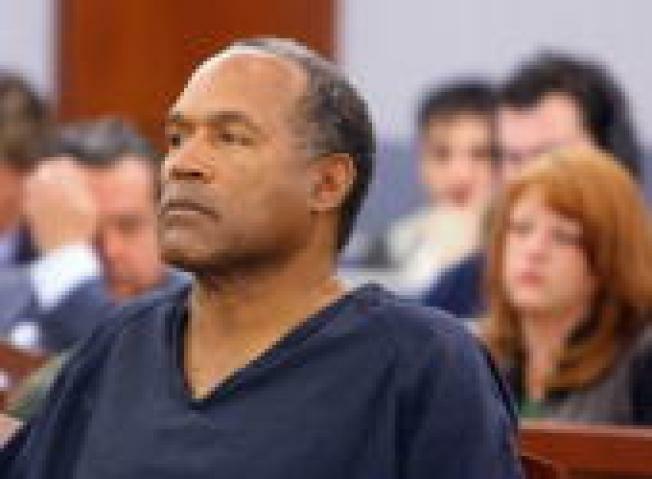 OJ Simpson will be in a familiar place this Monday: A courtroom. Don’t bet on an acquittal for O.J. Simpson, this time around. When the Juice goes to trial in Las Vegas this week on 12 felony counts, including kidnapping and armed robbery charges stemming from a September 2007 incident with a sports memorabilia collector in a Vegas hotel, odds are that the testimony of his accomplices will lead to a guilty verdict. A conviction could send O.J. to prison for life. Simpson, 61, is accused of leading an odd collection of characters, including three convicted criminals, to a casino hotel room, where they were charged with holding two sports collectibles dealers at gunpoint and taking memorabilia that Simpson maintains belonged to him. Simpson, who lives in Miami, has said he was trying to retrieve personal belongings and family heirlooms, that he didn't ask anyone to bring guns and that he didn't know anyone in the room was armed.But four of the five men who accompanied him have pleaded guilty and agreed to testify against Simpson. One, Michael McClinton, testified that Simpson asked him to bring guns and told him to look "menacing" during the confrontation with sports memorabilia dealers Bruce Fromong and Alfred Beardsley. The Las Vegas proceedings are sure to evoke memories of the 1994 trial of Simpson for the slaying of his wife and her lover. "I think the public is going to see and hear what they want to and hope that he is convicted," Jerry Reisman, a Garden City, N.Y., attorney who represented Simpson on business matters before the murder case said. "It's going to be difficult for O.J. to get a fair trial. A lot of the public believes he was guilty of the crimes he was charged with back then and he got away with it." The challenge for Simpson's attorneys will be to keep the focus on the current charges, he said. Simpson said he’s ready for the trial; his co-defendant, Clarence "C.J." Stewart, apparently, is not. Stewart lost another appeal to the Nevada Supreme Court to delay and sever their kidnapping and armed robbery trial. The plea by Stewart’s lawyer, Robert Lucherini, shed light on a closed-door deposition last week by an FBI audio recording expert and a review of jury questionnaires last week by prosecutors, defense lawyers and Clark County District Court Judge Jackie Glass. Lucherini says the questionnaires filled out by prospective jurors show opinions about Simpson will tilt a jury against Stewart. Justice James Hardesty says the court isn't satisfied that intervention is warranted. Will the public agree? "People ultimately want to see if he's going to finally end up in jail," Marlene Dann, executive vice president for TruTV told Newsweek this week. "It's not a murder trial, so in that way this is different. But it's still O.J., and there's still an ongoing public fascination."